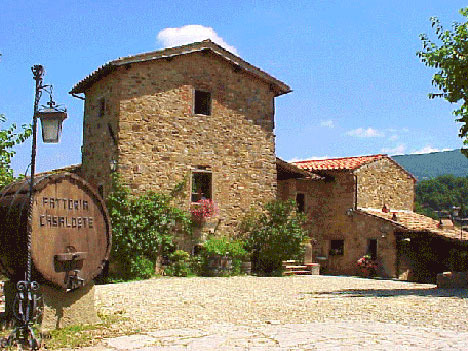 This is one of the most important boutique estates in Chianti Classico. Giovanni Battista d'Orsi, as owner, agronomist and oenologist, oversees everything at Fattoria Casaloste. He literally dedicates his life to producing some of the very best Tuscan wine one can find. The motto of the winery, essere piccoli per fare grandi vini (be small to make great wines), perfectly expresses their winemaking philosophy. 19.5 hectares of organically managed vineyards are located in the Chianti hills in Panzano in Chianti, municipality of Greve. "Arguably Tuscany's answer to the great Burgundy village of Vosne Romanee. There are so many excellent wineries here" J.Suckling Only 5,000 cases of hand-made wine are produced every year. The result is Chianti and Super Tuscan wine that is absolutely of the highest quality and character. Wine Spectator and James Suckling seem to agree, frequently rating Giovanni's wines in the top few in Chianti tastings. Feb 2014: The new "Super" classification of Gran Selezione is introduced and Casaloste's Don Vincenzo is one of only 30 odd wines to initially qualify for this most elite classification of Chianti Classico. Casaloste is certified organic according to Reg. CEE 2092/91 later followed Reg. CEE 834/2007 da I.C.E.A (Istituto per la Certificazione Etica e Ambientale).